What eye creams are you currently using? Is it your favorite or is it meh and you are just trying to finish it? I am currently at the meh stage. 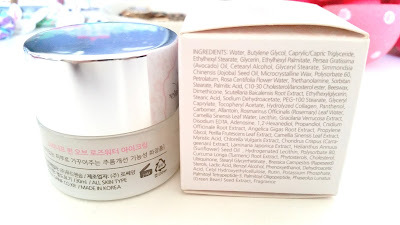 The one eye cream I do like is hard to find, so I am looking to try other eye creams. 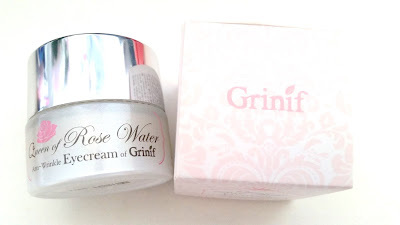 This one here is the Grinif Queen of Rose Water Eye Cream. 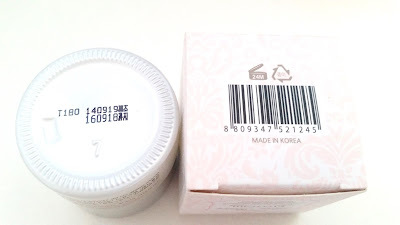 This eye cream came in the Memebox Superbox While You Were Sleeping box I purchased in late 2014. I just finished it, so I thought I'd share my thoughts on it. How did I feel about this eye cream? Well, let's just say I didn't end up using it as an eye cream. Product Description: A moisturizing eye cream formulated with rose water, collagen, macadamia seed oil, and witch hazel extracts to care for the eye areas. It can provide nutrition to the eye areas and provide anti-aging care as well. This eye cream will leave the skin around the eyes softer and moisturized. To Use: Take a small amount and apply it in a patting motion with your ring finger. Make sure to apply it evenly and avoid getting it into the eyes. 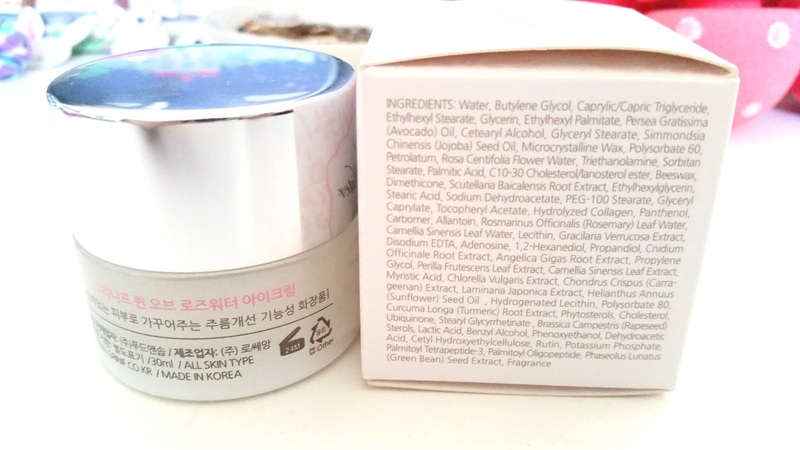 Ingredients: Water, butylene glycol, caprylic/capric triglyceride, ethylhexyl stearate, glycerin, ethylhexyl palmitate, persea gratissima (avocado) oil, cetearyl alcohol, glyceryl stearate, simmondsia chinensis (jojoba) seed oil, microcrystalline wax, polysorbate 60, petrolatum, rose centifolia flower water, triethanolamine, sorbitan stearate, palmitic acid, C10-30 cholesterol/lanosterol ester, beeswax, dimethicone, scutellaria baicalensis root extract, ethylhexylglycerin, stearic acid, sodium dehydroacetate, PEG-100 stearate, glyceryl caprylate, tocopheryl acetate, hydrolyzed collagen, panthenol, carbomer, allantoin, rosmarinus officinalis (rosemary) leaf water, camellia sinensis leaf water, lecitin, gracilaria verrucisa extract, disodium EDTA, adenosine, 1,2-hexanediol, propandiol, cnidium officinal root extract, angelica gigas root extract, propylene glycol, perilla frutescens leaf extract, camellia sinensis leaf extract, myristic acid, chlorella vulgaris extract, chondrus crispus (carrageenan) extract, laminaria japonica extract, helianthus annuus (sunflower) seed oil, hydrogenated lecithin, polysorbate 80, curcma longa (turmeric) root extract, phytosterois, cholesterol, ubiquinone, stearyl glycyrrhetinate, brassica campestris (rapeseed) sterols, lactic acid, benzyl alcohol, phenoxyethanol, dehydroacetic acid, cetyl hydroxyethylcellulose, rutin, potassium phosphate, palmitoyl tetrapepide-3, palmitoyl oligopeptide, phaseolus lunatus (green bean) seed extract, fragrance. Packaging: The packaging is pattern-full. The outer box packaging is white with pink patterns on it. It looks nice. I like that it came with the ingredients in English. The container is frosted and a bit sparkly, so you can't see what's inside. It's also a bit heavy for something so small. The lid is reflective and can sort of be used as a small mirror. Scent: This eye cream definitely smells like roses, but not the natural kind. It smells fake and it is strong. 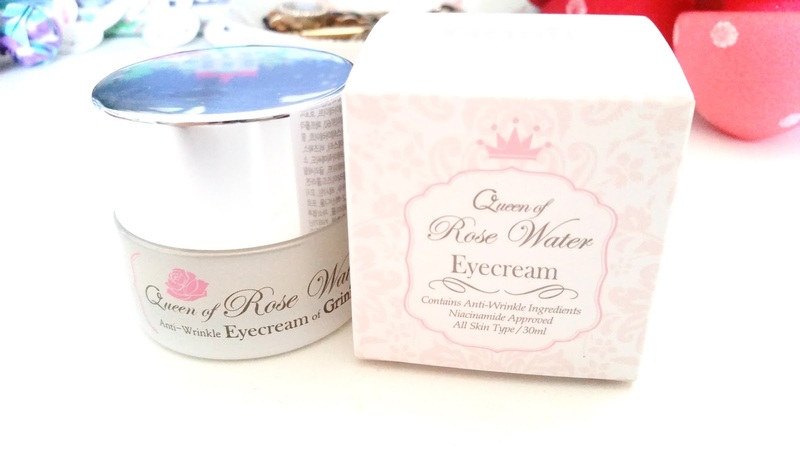 It looks like fragrance is added to this eye creams, which explains its unnatural rose scent. I think the scent makes it too strong to be used as an eye cream. Texture: The cream starts out thick. 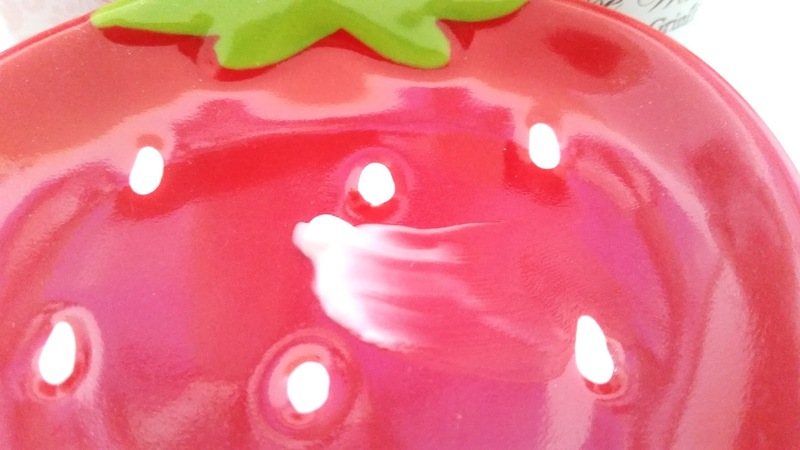 However, when you apply it, it turns to a more liquidy textures and absorbs faster. My Thoughts: This eye cream just didn't work for the skin around my eyes. For a $50 eye cream I expected better. The biggest issue I had with it is its scent. Its scent is just way to strong to be used around the eye area. I patch tested it and it made my eyes uncomfortable and watery, so I ended up washing it off. Patch testing helped me reveal so many issues with this eye cream that in the end, I just ended up using it for something else. The biggest issue as I mentioned is the scent. I think if the scent was more soothing it might not have been a big deal. However, this eye cream's scent is very strong and nose piercing. It also lasts like forever, so instead of feeling relaxed I feel like I might get a headache. I like rose scents, just not this fake rose scent. I really wish they toned it down on the fragrance. Which brings me to the next point, fragrance was added to this eye cream. So, if you are sensitive to fragrances, you might want to give this a skip. The third issue for me is the texture of this eye cream. It's a bit thick for my personal liking and although it does become more liquidy once applied, it tends to leave behind a slightly sticky feeling. Which isn't really pleasant. Jar eye creams can be a bit unsanitary. This one also didn't come with a spatula, which means those without extra spatulas will have to use their fingers. Our eyes are delicate and so is the skin around them, so having potential sanitary issues isn't good. 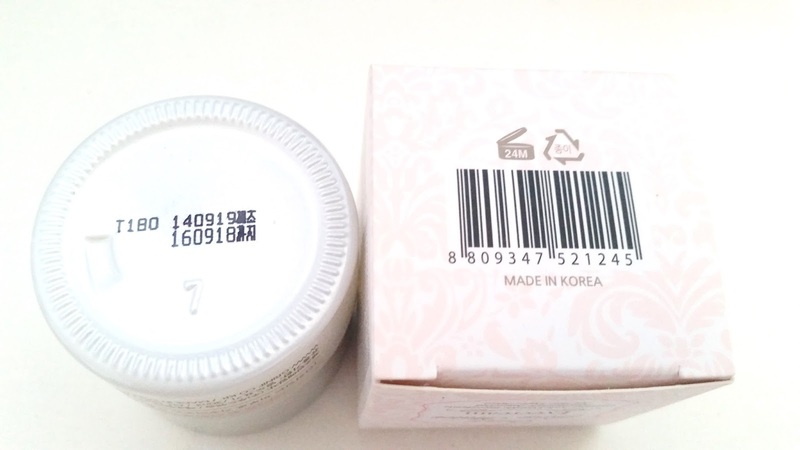 Since this eye cream is good for up to 24 months after opening, it means a lot of bacteria can potentially grow in it during this time. Also 24 months is a long time, so it means there must be a lot of preservatives added (yup, I count at least 4). Lastly, a lot the ingredients in the eye cream can be acne triggers and/or potential irritants. By my count, according to CosDNA, there's at least 12 potential acne triggers and at least 6 potential irritants. These might not cause issues for everyone, but it's worth a look before using, especially if you have sensitive skin type like me. So, if I didn't use this for my eyes what did I use it for? Well, I used it as a neck cream. Though the scent was still strong, it was more bearable using it as neck cream than as an eye cream. I didn't want to waste it, so this was the best I could do with it. It worked good as a neck cream. The scent was still the biggest issue and the slight stickyness isn't great either. However, it kept my neck area moisturized, so I used it until the end. This eye cream contains anti-wrinkle care extracts, so I also paid attention to see if it helped with the fine lines on my neck. My fine lines are fairly minimal to begin with and I was happy to find that it did help with them a bit. 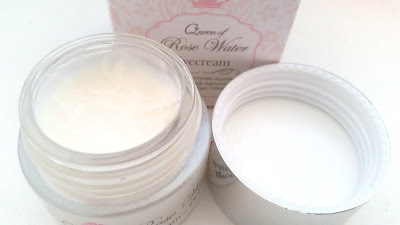 Final Thoughts: This Queen of Rose Water Eye Cream lost 3 hearts because I couldn't use it for its purpose. 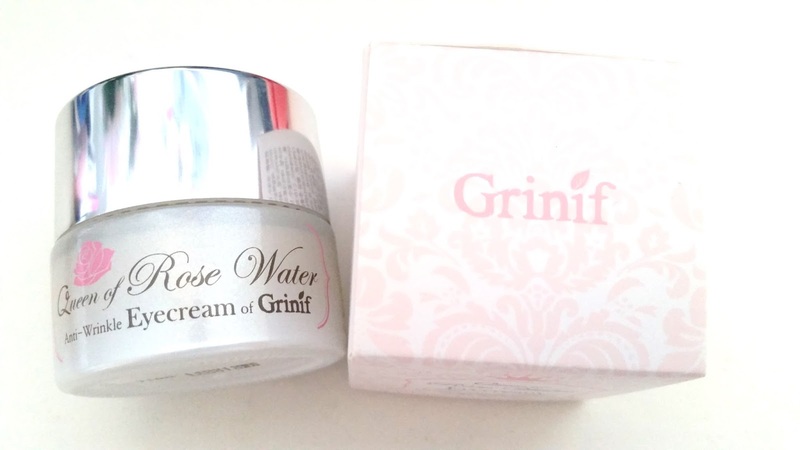 Its scent was way too strong for the eye areas and it made my eyes watery when I patch tested. It also leaves a slightly sticky finish, which isn't pleasant. As an eye cream, it had way too many issues so it had to be used for something else, like neck cream. I gave it 2 hearts because it did feel moisturizing and it was able to help with my fine lines a bit, so it's not a complete fail. Would I purchase this again in the future? No, just no. Do I think this is worth a try. No. Even if you have $50 to throw around, I'd suggest you throw it at something else a little more worth while.